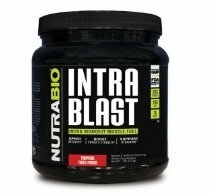 NutraBio Intra Blast is an essential amino acid (EAA) powerhouse that was developed to address the time between pre- and post-workout, commonly referred to as the intra-workout period, when critical nutrients are needed to fuel performance, blunt fatigue, and accelerate recovery. Unlike other intra workouts that contain only branched chain amino acids (BCAAs), Intra Blast contains over 10,000 mg of all 9 essential amino acids, including BCAAs, clinically dosed to work synergistically in order to stimulate muscle protein synthesis, promote muscle growth, enhance recovery, and decrease muscle soreness from the most intense training sessions. NutraBio took Intra Blast's formula one step further by adding other ingredients, such as glutamine and betaine, that have been scientifically proven to accelerate recovery, replenish energy stores, improve strength, and keep you hydrated during your workouts. Intra Blast is without question the most advanced intra-workout amino acid product ever created.